Wow, in the course of a few short days, Frank Wren and company turned a negative into a plus with the addition of a former number one over-all draft pick and sometimes misunderstood All-star in Justin Upton. To be honest, I did not see it coming. Along with former number one pick, B J Upton and a young and quickly maturing number one pick Jason Heyward, the Braves have put together an outfield that may only be behind the L A Angels in overall talent and ability, even that may be argued. Certainly, it is an outfield that could well hit 100 home-runs and drive in 300 runs over the course of a season. That and steal 60 bases, not to mention the potential to save runs which could vastly improve the entire Atlanta’s collective ERA. I have been trying to recollect when the Braves have fielded a trio of outfielders who have brought as much potential for excitement and honestly, I cannot think of another time in Braves history they have had this much talent in the outfield at one time. Most certainly, the starting outfield for the 2013 National League All-star game could have these three players in it. They are that good. To think, in the course of a few short years, the Braves have gone from having one of the weakest outfield to one of the best. Amazing. Sadly, the acquisition of Justin Upton did not come without a high cost. In addition to three minor league prospects and a once untouchable young starter in Randal Delgado, the Braves had to part with one of the most liked players in the organization in the person of Martin Prado. Prado was respected by fans and team mates alike because of his attitude and work ethic. In addition to being able to play every infield position, he had a perchance for being clutch. Not a big home-run hitter, he utilized the tools he had to spray the ball to all fields. He would on occasion hit the dramatic big fly but seemed to be just as content to hit a single the other way to move a runner over. For sure, if the Arizona manager, Kirk Gibson, wanted a gritty player, he got one in the 29 year old Prado. 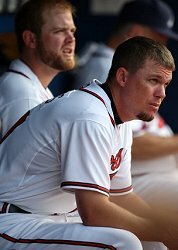 Now the only questions remain as to how well the combination of Juan Francisco and Chris Johnson are able to man the third base position which seemingly was to be held down by Marteen in the wake of Chipper Jones’ retirement. The Braves may have given up some defense with the addition of Johnson but Francisco has shone flashes of excellence at the hot corner. The reports out of winter ball have been very positive as to Long Juan in his effort to get into better playing shape. With the tremendous power one would wish to have in a third baseman, he appeared to have a bit of a lazy streak which cause the Reds to give up on the young Dominican and trade him to the Braves during spring training prior to the 2012 season. This after being the Reds heir apparent to play third on a full time basis in 2012 but Dusty Baker grew weary of Juan’s apparent indifference to the Reds’ directive to show up in shape. For sure, Dusty will not abide a lollygagger. 115: And in a close play at the plate the Braves are……. Coming down the home stretch it looks like it’s going to be a close play at the plate for the Braves. Last year at this time, we were all thinking, the Phillies are going to catch us but we should still make the playoffs, after all, no one has ever not made it with so much cushion. Then the doubt set in as two thirds of the starting rotation went down and Prado came up lame at the final turn. Alas, perhaps one of our greatest fears came into being. The only thing that saved the Bravos from being the number one choke story of the year is the Boston Red Sox managed to pull off the same feat. playing October baseball but perhaps this season, Atlanta will limp across the finish line ahead of the pack. Certainly, our pitching staff looks to be in better shape and the position players are not nearly as nicked up as last season. enviable position but it is certainly a more enviable place to be than perhaps Denver or Kansas City or the twenty two other major league teams who will be calling it quits after game 162 of the schedule. Heck, some of those teams called it quits on July 4th. Just ask the Marlins…. Anyway, adversity builds character and Lord knows the Braves have had a lot of character building done the past five or six seasons. At least the Braves have a solid pitching staff and a very deep and dependable bullpen to go with an offense which has shown it can get as hot as anyone for extended stretches. I think we can pretty much rely on the likes of Venters, O’Flaherty, Durbin and Kimbrel to come out of the pen and make any game a 6 inning game. If only the Braves can keep Hudson, Sheets, Hanson and Maholm from giving the game away in the first six innings, I like our chances. Okay, maybe not enough to bet the family farm but I would be willing to put up someone else’s farm…..
Looks like McCann is finally breaking out of his doldrums. Now, if only there was someone Uggla could talk with to get him turned around. Chipper is getting back to where he was before the misplayed one hopper nearly took his leg off. McCann is making good contact. Bourne and Prado are just outstanding right now. Freddi Freeman is learning to play through the pain, Jayson Heyward is getting back to his rookie form and Simmons is really a nice surprise with the bat. That leaves Uggla on the MIA list. That and having a reliable guy at the back end of the rotation. 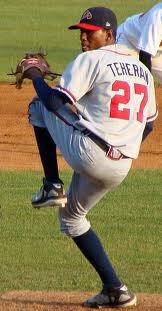 Oh, and someone beside Venters to come in and throw gas on the fireman. After all, they are called fireman because they are supposed to be able to douse the flames, not be arsonist.. If Ben Sheets could return to form, that would be the outstanding story of the year, right next to Jair coming back and maybe Moylan being Moylan and being the ground ball artist he once was. So, who do the Braves release to make room for another bat? I would say Jack Wilson is the 25th guy on the roster right now, closely followed by Hinske and Diaz. I once thought it would be Francisco but the big third baseman appears to be turning the corner a bit. The kid has so much raw power, he fails to realize the wall scraper count just as much as the 450 foot bombs. The only thing a big long loopy swing produces is a whooshing sound as the bat passes over the ball…. Minor or Delgado? Which has been more effective or maybe more correctly, who has been more consistent? One of them will go when Sheets comes up. Both have options, one is a righty who has better velocity, the other is a lefty. Both seem to hit the wall at some point. I think the prevailing thoughts of the many talking heads in baseball is the Braves need to do something to solidify their pitching staff. Adding another reliable and proven starter to the mix is the most likely answer. None of us know what kind of financial constraints Frank Wren is under but expecting to find the winning lottery ticket under your pillow is not likely to happen and makes for a pretty poor business strategy. The old adage in racing is speed cost money, how fast do you want to go? Well, the same is true in baseball… Yes, sometimes a team finds the “Golden Ticket” but for the most part, to be a consistently winning franchise, you have to be willing to shell out the big bucks, just ask Ted Turner. MECHANICSVILLE, VA – So, here we sit with about six weeks to go in a season that has seen the good, the bad and the ugly from the Atlanta Braves. Early season doldrums returned immediately following the All-star break and as of the this writing we have watched as the once comfortable cushion of 6 games in front of our closest pursuers shrink to two as the Philadelphia Phillies have put on an incredible run of thirteen wins in fifteen games. 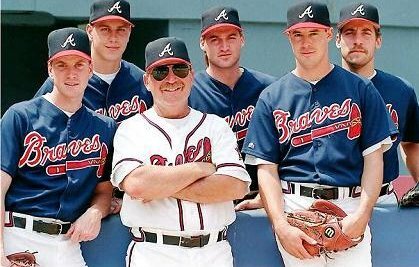 The scariest part may be they have done it without their best players on the field and a bullpen that rivals some of the worse Atlanta has ever assembled. And here we thought our old nemesis, the New York Mets, would be our biggest problem. Well, I guess our good friend John Smoltz tagged it right when he dubbed the NL East as the shoots-and-ladders division. Shame on us for thinking that maybe the Braves would run away with this thing. After all, don’t we still need that “Big Bat” in the middle of the order? line-up but Omar has hardly missed a beat. Dare we guess how the Braves might perform with both Infante and Prado in the lineup together on a regular basis? While Marteeen appears to have cooled somewhat since the beginning of the final series with the Mets prior to the All-star break, it was not due to a lack of contact but more as a results of the law of averages catching up to him as those line drives he was stroking began to be hit directly at people. On the up side, maybe Jason Heyward is finally understanding that while hitting the ball the other way is a good skill to have, always hitting to the off field can make you pretty predictable too and cause you to be an easy out in the line up. It is good to see the Braves Rookie of the Year candidate start to hit the ball with authority to right field again. Sometimes you need to be in scoring position while standing at home plate. That’s not to say we want to see J-Hey swinging for the fences every at bat but he needs to remind opposing pitchers of what he is capable of occasionally to keep them honest. Chipper Jones may have found his lost stroke again too. After watching him struggle for the first eight weeks of the season, I think we were all wondering if Larry had indeed reached the end of the line. Right now, the Braves truly need for him to step up. Chipper is capable of carrying this team for extended periods and now would be the perfect time for him to do it. potential defensive prowess at first but to add some right handed pop in the middle of the line-up. We all thought Frank Wren might have made the steal of the century in signing Glaus to a low cost, low risk contract when he lit up the scoreboard in late May and July. Sadly, as his knees began to show their age and his bat did the same. The Braves woeful record of failing to hit with men in scoring position can be directly attributed to Glaus’ lack of production. Since the departure of Texieria , the Braves assembly of hitters has not exactly struck fear into the hearts of opposing pitchers. There are so many glaring holes in the lineup that pitchers feel no need to pitch to Chipper Jones or Brian McCann when they know there was an declining Troy Glaus or an out of sync Nate McLouth in the on deck circle. Still, that brings me back to the Braves most pressing need, that one big bat in the middle of the order that forces opposing teams to throw to Jones and McCann. Without a guy who can consistently put a three run homer on you if you walk guys like Brian and Chipper, opposing teams will continue to load the bases with apparent impunity. Protection can pay big dividends, just ask the guys who hit ahead of Fielder and Howard. So, the question remains, will the Braves pull the trigger and make the trade for that final piece, will they call up Freddie Freeman or will they simply stand pat? We are not privy to how much money the Braves have to work with nor do we know if the Braves front office is content to make it to the playoffs or seriously wants to vie for a World Series title in Bobby’s final year. That said, without that final piece to the matrix, the Braves may yet find themselves on the outside looking in come October because only four teams from each division are going to the big dance and there are at least eight teams in the running for a date. Great pitching can carry you a long way but you still need to help them out by scoring more runs than the opposition. Unlike soccer, baseball games do not finish in O-O ties.